Since 1996, Lee has been THE creator of the world's most realistic NIGHT SKY MURALS for home theater rooms! Lee's hand painted murals are truly amazing. 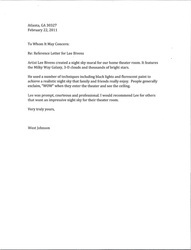 Clients are absolutely thrilled with Lee's work, please read referral letters below. Based in Atlanta, GA. Lee Bivens murals are a SUPERIOR option to fiber optics. Inquiries welcome. 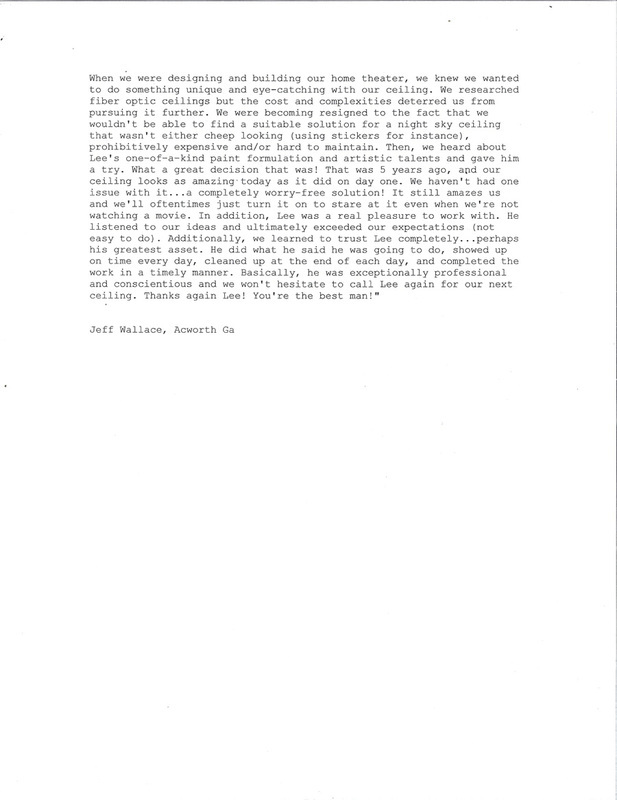 The following are actual client testimonials. Wow, Lee the night sky is beautiful. We did not know it would be like that! It took my breath away. My mother loves it and I sent a picture to K. He will be home soon. Thank you so much! It is great. The sky is so beautiful I do not even have words. I love it! This is great. Lee, I feel this is not your talent, it is your PASSION! OMG Lee you nailed the deep space look I wanted. It is perfect. TAKE my money!! Thank you so much Lee! The mural is far better than I could have imagined! My wife was hesitant at first, our friends told us to us fiber optic, but I am so happy we chose your work! I is far superior in person. Lee, the clients absolutely loved the mural. They had people over for the Alabama football game and everyone couldnt believe it. Thank you! Thank you very much Lee! The night sky looks great. The homeowner will be home after training camp to see it soon!!! My wife loved the northern lights we asked you to paint from our vacation photos! And when my 16 year old daughter came home she said she did not want to watch a movie, just sit back and look at the night sky!! Lee, the ceiling is awesome. I watched a little of a movie tonight and it makes the room seem bigger. It’s like having a sky above you. The 3D effect with the clouds in the far side when you come in the room is really neat. The comet looks like its way out there as well the way you mixed it with the cloud. Sooo cool! Thanks again. It was great having you. 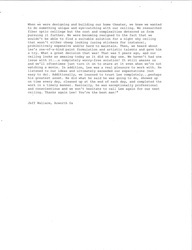 Art Lee, I feel terrible that I haven't written until now to complement you on your work. The ceiling you did for us is incredible and is certainly a beautiful work of art. They are working on the final touches this weekend and we will begin enjoying the room very soon. Thanks again for sharing your talent. Hey Lee, We are so in love with our pieces. People who see it are I blown away by the murals. Let me know when we can talk about the portrait. Thanks! Hello Art, I am very pleased with the mural you did in the theater room. I look forward to showing my daughters this weekend. 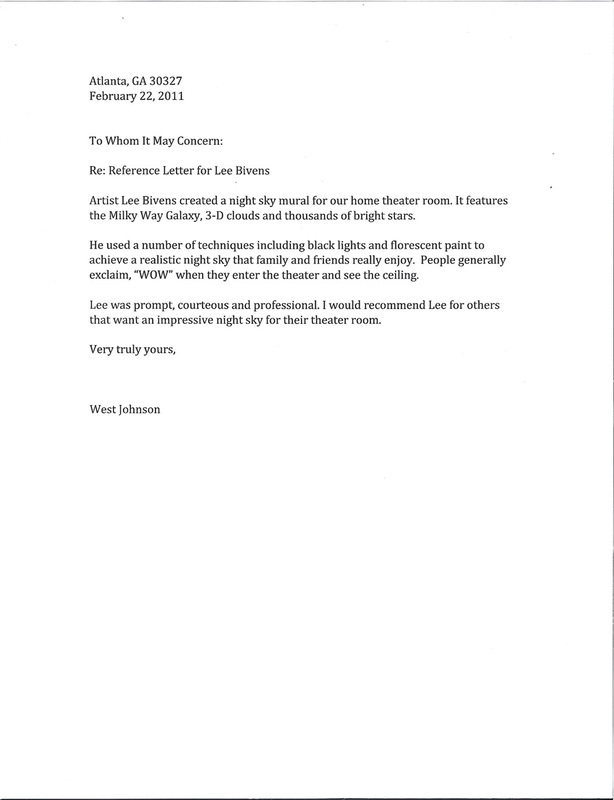 Hi Lee – we are blowing people away all over the country with your artistry. Have a home theater company in KS that is already interested. I took the attached shot. If you have a better one, please send it along. Tom S., Harbor Club, Lake Oconee, GA.
Everytime I show your mural to someone they are blown away and cant believe it. I love this thing! It was a great idea. P. Hernon, Dana Point, CA. "When I got home I walked into the Theater room Lee Bivens had just finished and was absolutely blown away. This is brilliant! I did not think it was possible to look so good. Amazing. I am in shock. My wife and I sleep down there sometimes now. This is genius, Lee you are a genius! We love it man! Lee, I wanted to thank you for such a beautiful and amazing mural. It is wonderful and we will enjoy it. Our home theater room is the talk of the neighborhood now. All of our friends are blown away! Our night sky mural is great! Thank you so much! The kids loved it, they could not stop dancing under the moon. This is our third house in a row that we have commissioned you to paint. they are all good, but this one is beyond words. The sky looks real. We love it! Thanks again Lee. 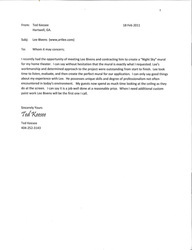 Lee, though I was unable to meet you in person, my wife said you were great to work with. When I walked into my theater room after returning from my work trip, I was absolutely stunned! My night sky mural is far beyond what I expected. i cant get over the moon and comet not to mention the stars and milkyway. WOW. Incredible job Lee, thank you very much! I was given Lee's name by a friend who had his theater ceiling mural painted by Lee. After seeing his ceiling, we knew we had to do the same. I call his night mural masterpieces because they truly are a work of art. 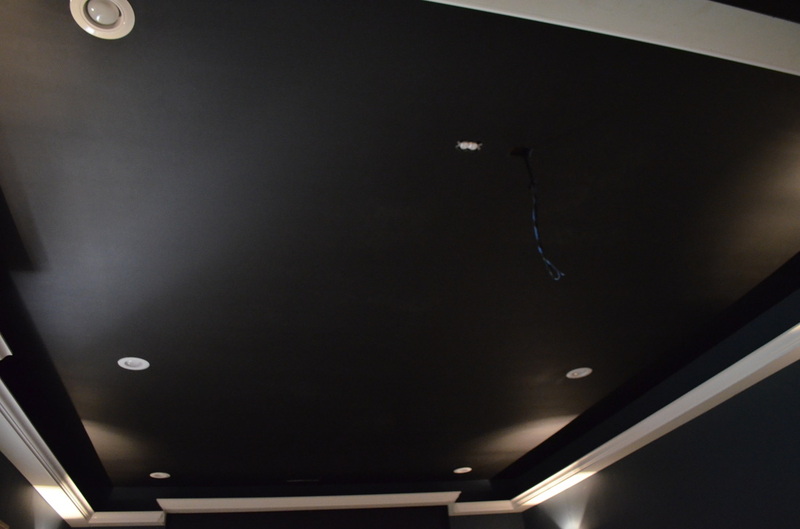 The words out of contractor's mouth (who has done hundreds of theater rooms) after seeing the results were, "That is the most incredible ceiling I have ever seen." My wife was speechless when she saw what Lee had accomplished and my kids go down every night to run around beneath "the stars." If you want your theater to truly stand out, turn it over to Lee. He will create a timeless classic for you and your family. Dr. J. Chen, Marietta GA. AWESOME work! The spirit of God must have been with you during this work. It's simply heavenly! Thank you, thank you thank you VERY much! 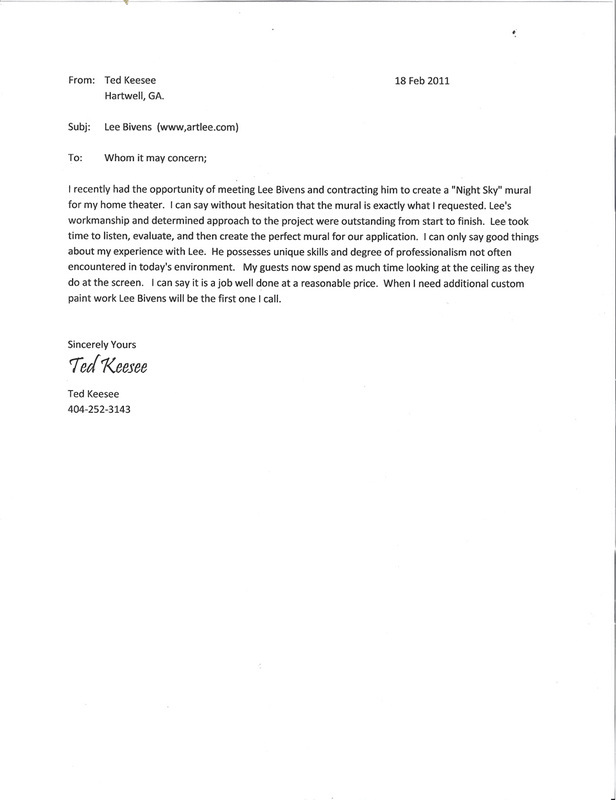 -Eric Porter, Stone Mountain GA.
Home theater dealer quote: "My night sky mural is looking great Lee, I had this nice couple come in the view your ceiling and they sat there looking at it for three hours! I had to finally ask them kindly to leave. Everybody we have over here loves it, they are amazed."